There is a figure that more than any other influenced the equestrian imagination: that of St. George, the Holy Knight, who over the centuries became the symbol of chivalrous valor that defeats evil. A curious fact when you consider that, although uncertain and contradictory, the small amount of information that traces his life and his martyrdom between the Third and Fourth centuries, does not mention his exploits on horseback, nor specifically characterizes him as a knight. The legend of his fight with the dragon was, in fact, first diffused in medieval times, then becoming his essential characterization, deeply affecting popular imagination, to the point that he became the patron saint of knights and saddlers (as well as armorers, soldiers, fencers and archers), and orienting almost univocally the subsequent iconography. The essential information about St. George’s life came to us mainly from the so-called Passio Georgii, an hagiographic work that was, however, already labeled by the Decretum Gelasium of 496 as apocryphal (ie. unreliable because false) and from a few other texts that resemble, often altering, the same essential data. Sources tell us that George was born in Cappadocia (in modern Turkey) from a Persian father and a local mother, and that he was educated to the Christian religion and entered the imperial army. When the Emperor (who according to some sources was Dacianus, emperor of the Persians, but according to others was Diocletian, emperor of the Romans) decided to persecute the Christians, George gave his possessions to the poor and publicly professed his belief. After refusing to offer sacrifices to the gods, he was submitted to martyrdom, but he died and was raised three times, working each time conversions and miracles. The cult of the martyr and of his relics soon began. We know from works such as the De situ terra sanctae, by Theodore Perigeta (of about 530), that in the city of Lydda in Palestine (today Lod, near Tel Aviv), a basilica existed which was built in the time of Constantine over the tomb of the saint and other martyrs of the persecution of Diocletian (303 d. C.). 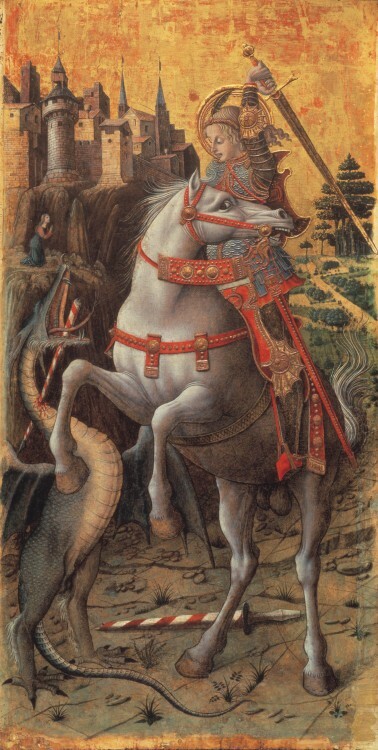 It seems instead that the story of the battle with the dragon dates back to the age of the Crusaders and, according to some, would be born from the false interpretation of an image of the Emperor Constantine, portrayed in the act of standing above a pierced monster, seen by Christian knights in Constantinople. From there it would have spread like a folktale to be subsequently drawn on in La vie des Saints of the Norman troubadour Robert Wace (about 1115 to 1183, he was also the author of the Roman de Rou) and especially in the Golden Legend by Jacobus de Voragine (1228-1298). It tells that the population of Silene, in Libya, was terrorized by a dragon who lived in a lake not far from the city, killing anyone he could get hold of with his deadly breath. To placate him, the inhabitants offered him two sheep a day. The animals became scarce, but the terror of the people was such that they resolved to sacrifice a sheep and casted lots for a young boy or girl. After a few days, the name of the king’s daughter came from the lottery. The king tried to save her, offering his treasures in return, but the people who had seen their children die, rose up and, in the end, the princess was offered, crying, to her death. Just then, a young knight, George, was passing by, and, as soon as he knew what was about to happen, he offered to save her. When the dragon appeared from the water, sparking flames and smoke from his mouth, the young man went to meet him, galloping with his lance at his side. The battle was terrible, but the rider was able to pierce the monster, wounding him and knocking him down. George then turned to the girl and inspired her not to be afraid and to fasten her belt around the neck of the beast. Immediately tamed, the dragon began to obediently follow her up to the city. Seeing her arrive, accompanied by the monster, the inhabitants panicked, but George told them not to be afraid, that God had sent him to rescue them. «Be converted to the faith in Christ, he said, and I will slay the dragon». The king and the people did submit to baptism and the knight then beheaded the dragon with his sword. 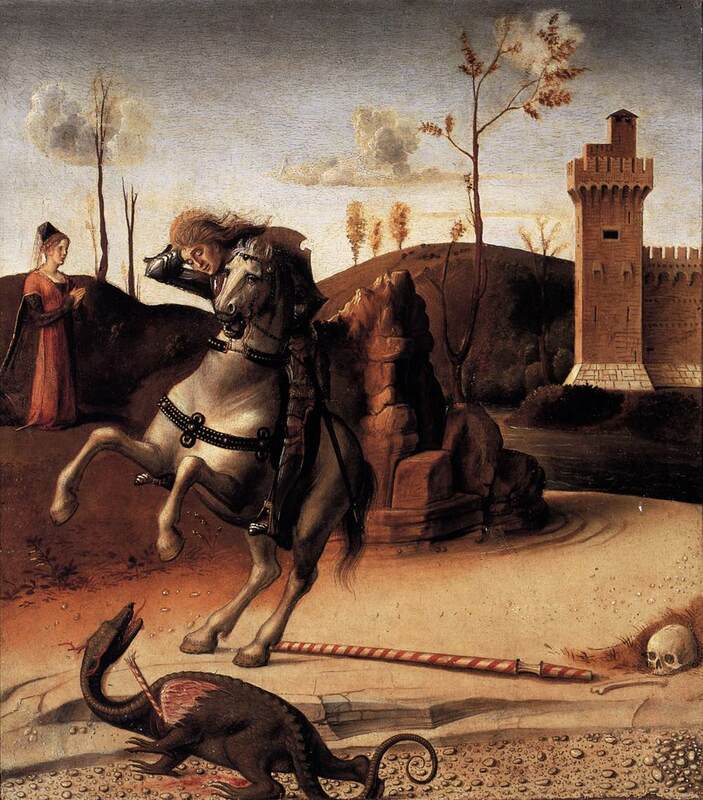 The legend has the typical features of an adventure from courtly romances: the noble damsel in distress, the heroism and devotion of the knight, the crucial trial which places the latter against a monstrous incarnation of evil. It is no coincidence that the story spread in the era of the full splendor of chivalric society and of the works that sang it’s deeds with epic tones. In particular, the episode summed up, in an exemplary manner, the mission of defending the unarmed and the Christian religion that was the foundation ideal of medieval chivalry’s spirit. This decreed it’s success and explains how the legend ended up in completely overlapping the life of the saint, imposing on the popular imagination. 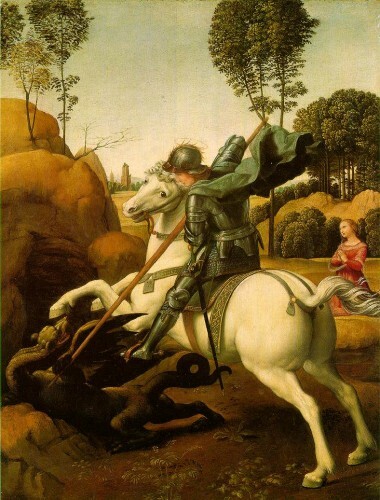 The same characteristics also explain the huge success that the clash between the holy knight and the dragon received in the visual arts, offering a perfect synthesis between a sacred subject and profane values. It is impossible to list all the artists who, since the Middle Ages, identified themselves with this fundamental image to our civilization. The legend also reflects clearly the influence of the myth of Perseus saving Andromeda from the terrible monster sent by Poseidon to punish the pride of his mother, Cassiopeia. 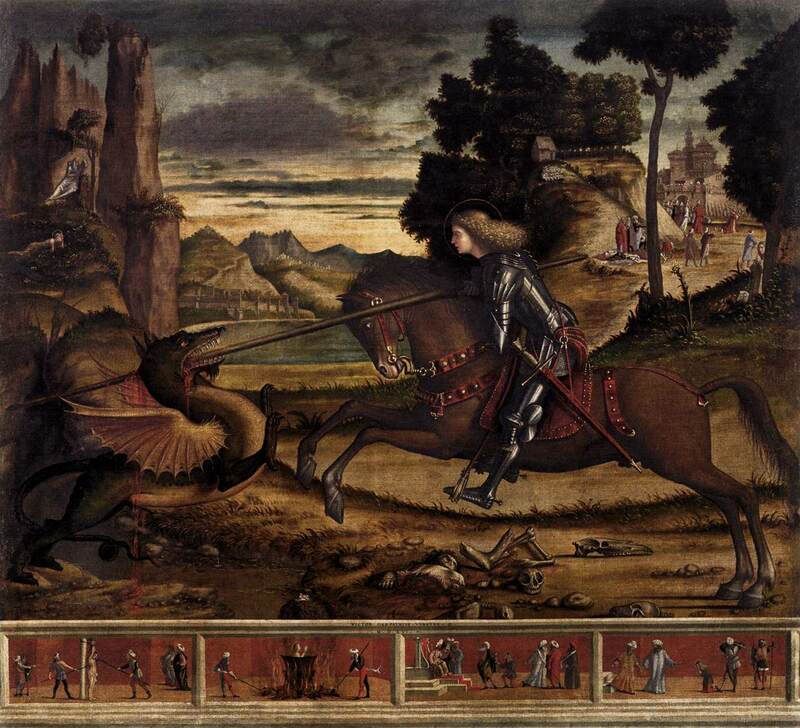 Similarly, it is clear that in the figure of the young warrior who faces, on horseback, a fantastic creature, we find an echo of the myth of Bellerophon and Pegasus’s battle against the Chimera (to which we devoted a previous article in this blog). The intercession of St. George was considered particularly effective against plague, leprosy, syphilis, poisonous snakes, and diseases of the head. Speaking of horse breeding, in his treatise Razze, disciplina del cavalcare ed altre cose pertinenti ad esercitio così fatto (Races, discipline of riding and other things relevant to this exercise, 1560), Giovanni Battista Ferraro, argued that the window of opportunity for covering the mares began with the feast of St. George (23 April), «that being such a saint the patron of knights, it’s better that this job starts on the day dedicated to him» (Ferraro, 1602, I, p. 6). 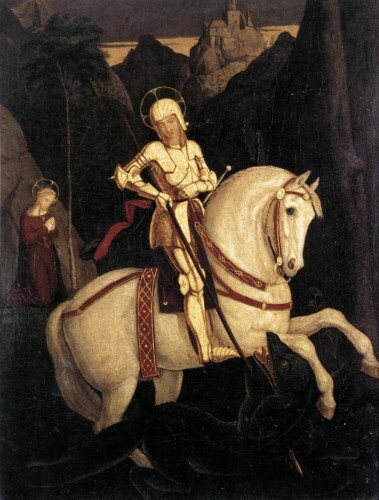 Many “sacred mysteries”, ie processions and mystery plays, were dedicated to the celebration of St. George. In the fifteenth century, the so-called Ludus draconis had a certain spread and was later taken up and imitated in many spectacular performances that accompanied the Renaissance jousts. The cult of St. George was particularly widespread in England and was further consolidated after the Norman Conquest (XI cent.). During the Third Crusade, Richard I (1157-1199) claimed to have seen the Saint covered with his shining armor at the head of the Christian troops. His successor, Edward III (1312-1377), introduced the famous battle cry “St. George for England” and founded (around 1349) the Knightly Order of the Garter, in whose vestments the emblems of St. George are essential. Various other orders of knighthood bear his name, such as the Teutonic Order, the Military Order of Calatrava of Aragon, the Sacred Constantinian Order of St. George, etc. Finally, the red cross of St. George on a white field stands still on the English flag. Thank you very much for your interesting comment. I find the link with the Dioskuri particularly fascinating. I hope to deepen the mythical figures of the heavenly twins, who were often described as “horse tamers”, in a new article. Thanks for this excellent post, so appropriate for the saint’s day! 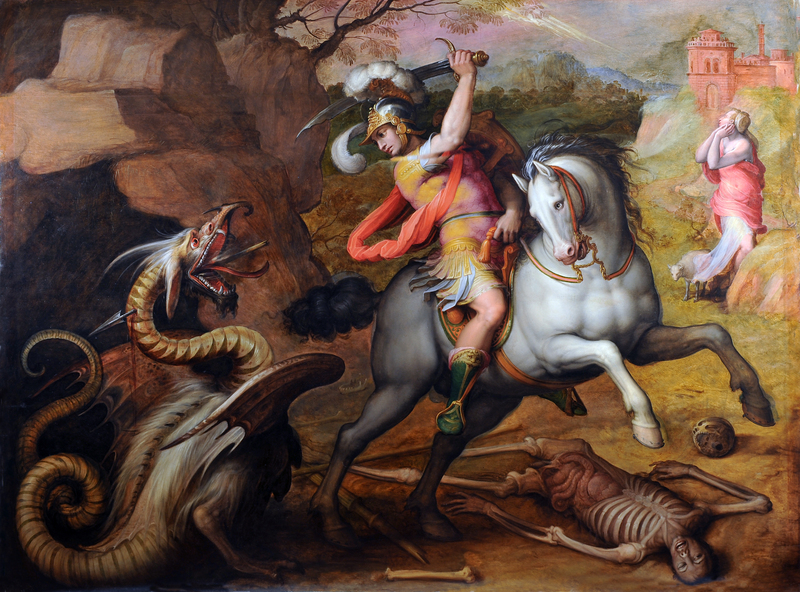 It is remarkable how popular the cult of St George became throughout Europe. He was a popular patron saint, perhaps especially for members of the high nobility and their causes, in Sweden and Denmark as well as in some of the better-known places. You may already be aware of the fabulous, late fifteenth-century sculpture of St George fighting the dragon in Stockholm (Storkyrkan). If not, you should look it up, it’s quite special. I’m very glad that you liked my article. You’re perfectly right, the statue of St. George and the dragon in Stockholm is really special. The same subject was an inspiration for many masterpieces. Thank you very much for your comment. I actually love your post. I read your blog fairly regularly and you’re always coming out with some amazing items. I shared this on my FB and my followers simply loved it.